After inheriting a two-bedroom Victorian flat in the 1990s, Fern and John Armytage set about transforming it into the perfect space to stay while visiting London. Elsewhere, the space in the property wasn’t being used to its full potential; a single bedroom appeared cramped due to lack of natural light, and there was one, small bathroom. However, the apartment offered a useful London crash pad for Fern, John and their family and friends. The project to remodel the interior began when the couple decided that they wanted to reconfigure the interior space to allow for a second cloakroom and a proper washing machine. After seeing renovation work done to another flat in the building, they enlisted the same architects, Amos Goldreich Architecture (AGA), to produce the designs. ‘Our architect was able to show how the property could be completely transformed,’ says the John. 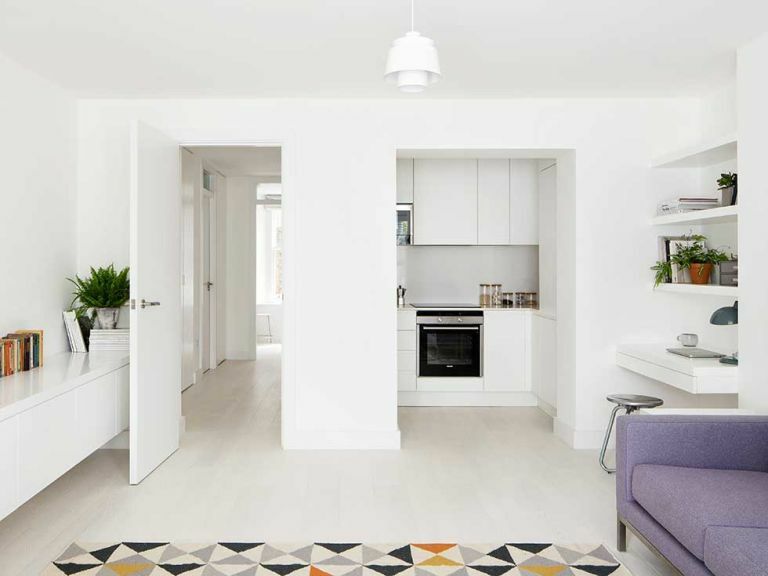 The brief was to maximise the potential of the flat by improving the layout of the space to make it feel better, introducing storage and creating an open plan living area. This was achieved by relocating the kitchen and bathroom. The energy efficiency of the entire property was improved with new lighting, plumbing and underfloor heating. The wall between the original bathroom and the living room was demolished to create an open-plan kitchen/dining/living space. Although the kitchen is still small, it contains all the appliances and storage facilities the couple need. The kitchen design is from Casa Lube. In the living area, light floods in from the bay windows, which were replaced with double-glazed, timber sash designs. The sofa is by Hitch Mylius, supplied by Pink Apple Designs. The feature rug adds pops of colour to the space, similar geometric rugs are available at Made.com. Creative bespoke joinery makes use of awkward areas to form extra storage. Here, a desk and shelving provide workspace in the living room. A dining area has been created with a wooden table and chairs by Carl Hansen, from Pink Apple Designs. Whitewashed oak flooring was laid throughout the flat, except in the bathroom and guest cloakroom. AGA designed new storage solutions for the project, including a floating sideboard in the living room, which has a streamlined look. Combining the second bedroom with the original kitchen introduced more light into the bedroom, as well as creating space for a new bathroom. The bathroom has a slot window in the wall to allow natural light in, increasing the feel of space. The bathroom fittings were chosen by AGA and supplied by Ocean Bathrooms. The vanity unit is by Duravit. The new guest cloakroom, created from unused space in the corner of the master bedroom, is fully tiled in a white hexagonal mosaic pattern, supplied by Ocean Bathrooms, taps by Dornbracht and Vola, and basin by Catalano. The bathroom is decorated with marble, from Ocean Bathrooms, to create an understated yet luxurious look. A recessed shelf offers a place to put toiletries. All the walls and joinery have been painted white as part of an intentionally minimal palette of materials. It allows colour to be introduced with furniture and accessories, like this bold blue bedspread. A window between the kitchen and the entrance hallway was added to create a visual connection and a sense of flow between the two spaces. This bespoke walk-in-wardrobe with sliding doors in the master bedroom was designed by the architect and built by the contractor.